Clicking on the image will show it larger in a new window. 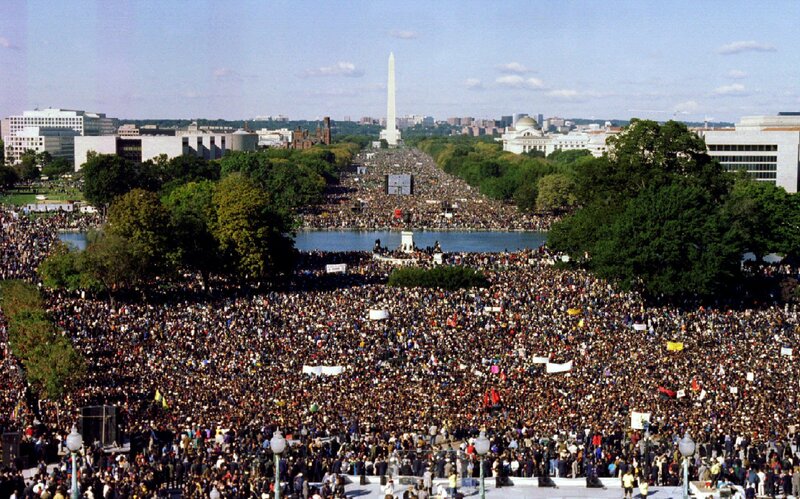 On October 16, 1995, perhaps a million black men gathered for the Million Man March on Washington. This was 32 years after Martin Luther King, Jr. gave his historic "I have a dream" speech at the Lincoln Memorial to 250,000 civil rights supporters. The National Park Service, who is responsible for overseeing the logistics of having a rally on the Mall, estimated that only 400,000 men had attended. This was widely disputed at the time. Since then the NPS no longer estimates crowd size but how do you count a crowd? For members we have editable documents and teaching suggestions.